This month’s business spotlight is shinning bright on Jamie Brooker, an independent consultant for Initial Outfitters. Before you know it…..Valentines, Teacher Appreciation and Mother’s Day will be here. She has some beautiful gifts that would make anyone feel loved. 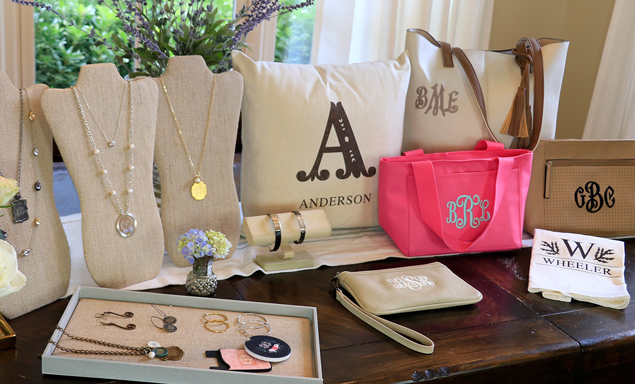 Jamie and Initial Outfitters are also a wonderful source for personalized closing gifts too. Initial Outfitters is a home/catalog/online party company with a unique collection of personalized jewelry & gifts. Initial Outfitters is Your Style Made Personal! Jamie and her husband, of 22 years, have 2 children and a dog named Pete. She began her adventure with Initial Outfitters over 2 years ago and has been very successful. Whether you are looking for a special gift or just something for yourself, Initial Outfitters has a great selection. Follow the link below to check out some of the great products Initial Outfitters offers. I love my jewelry that I have purchased from Jamie. One of my daily go to pieces is a lovely cross bracelet secured by a leather band. Our favorite closing gift is their cutting board. You can have them and other closing gifts personalized. Another thing that I love about Jamie is her heart. She has a passion for her community and I can always count on her for supporting our local military and their families. Friends and agents, be sure to take a look at her line…..you won’t be disappointed.